Steve Martin & PBS: The banjo's been called America's quintessential instrument, perhaps because its long and contested history has encompassed so many popular musical forms, from black folk styles and the 19th century minstrel show, to blues, ragtime, early jazz, old time folk and bluegrass. Could there be anything more important than the banjo? Abq Jew doesn't think so. 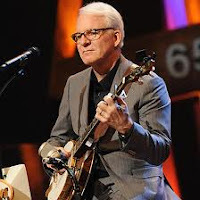 Neither does Steve Martin - yes, that Steve Martin, the comedian and writer, famous again, this time for his banjo work with the Steep Canyon Rangers. And neither does PBS - yes, that PBS, home of Masterpiece Theater, Antiques Roadshow, Frontline, and Nova. Narrated by Steve Martin, Give Me the Banjo brings together contemporary players - including Pete Seeger, Earl Scruggs, Bela Fleck, Mike Seeger [of blessed memory], Don Vappie, Abigail Washburn and The Carolina Chocolate Drops - with folklorists, historians, instrument makers and passionate amateurs to tell the story of America's instrument in all its richness and diversity. You can view the entire program (you know you'll want to) right here. But, Abq Jew suspects, some of you may be asking - is the banjo good for the Jews? See below. Watch PBS Arts from the Blue Ridge Mountains: Give Me the Banjo on PBS. See more from PBS. YES, the banjo is good for the Jews! In fact, the banjo has been very, very good for some Jews - such greats as Bob Yellin, Pete Wernick, and Eric Weissberg (Dueling Banjos) immediately spring to what's left of Abq Jew's mind. The biggest names in the park in the late 1950s were Eric Weissberg, Marshall Brickman [yes, that Marshall Brickman], Tom Paley and, last but not least, Roger Sprung—all banjo players. "Don't give up your day job."